The internet loves nail art. There are hundreds of Pinterest boards filled with the most incredible nail art designs, along with a handful of Intsagram accounts and not to mention my favourite nail art blog One Nail To Rule Them All, which is written by Alice and features some of the most pretty and creative designs. And although I’m a lover of nail art, I must admit I haven’t attempted it myself in a long time. But gone are the days of nail art being just for 9 year olds and the 90’s! So when I got contacted and asked if I would like to give the Rio Proffesional Nail Art Pens a go, the 9 year old in me couldn’t say no! The Rio Nail Art Pens Kit (classic)* comes with six shades of polish and each polish has a 2-in-1 dual action detailing pen and a fine line brush. You also receive a nail art brush, step by step DVD and nail art instruction with a chart of designs. You get a lot for your money! Also, on the bottom of each bottle there is a little pin which can be used to unblock the detailing pen (and I must say, I initially thought this was to be used to create more intricate designs... I’m such a numpty!). Overall, I was so impressed and presently surprised with how easy they where to use and control - although a little patience and a steady hand wouldn’t go a miss. The polish comes out of the detailing pen with a gentle squeeze and I can’t fault the fine line brush. The DVD came in handy (pun intended!) and is brilliant for beginners, as it shows a step by step guide on how to do the basics. I instantly went online in search for some nail art inspiration and as I work at a Zoo I decided animal themed nails would be very appropriate! And I’m so happy with how they turned out, even if there was a couple of failed attempts! 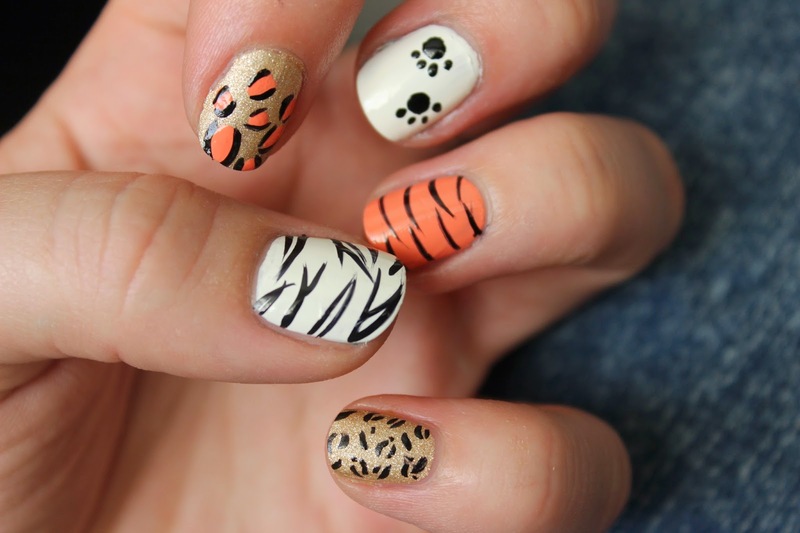 And it’s fair to say I have fallen back in love with nail art again - I love how creative you can be! But as they say practice makes perfect!